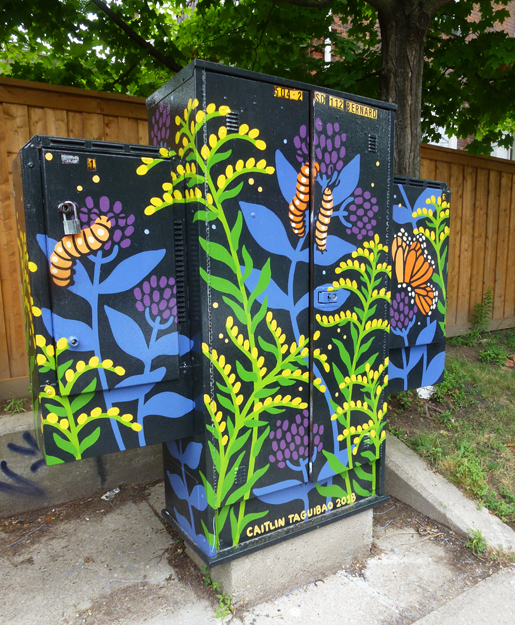 I spotted this newly painted utility box recently in the Annex neighbourhood. The monarch butterflies are starting to appear around town as they get ready for their journey south and this mural gives a bit of a view of their life stages on their favourite milkweed plants. The artist for this one is Caitlin Taguibao. The mural is a beaut. Hello, love the butterfly and caterpillar murals. Beautiful! Excellent painting on this utility box. It certainly adds to the neighborhood. So pretty and colourful, love it! Much nicer than a boring box, and educative too. Oooohhh, I like this one very much. Someone needs to tell our city leaders about painting utility boxes like this. It's such a great idea. I love Monarchs. Wish I'd gone to their winter home in Michoacan when we lived in Mexico. Beautiful and nice idea, too. A lovely use of art! Bravo to the artist.